It’s not always puppies and unicorns with everything going your way. There are no promises that everything in this life is supposed to be perfect. There are trials. But what are you saying when you’re going through a difficult trial? You’ve got to watch your mouth. There’s no denying that we can have a negative verbal reaction when we receive bad news. It’s like hitting your finger with a hammer… there’s likely to be some colorful language to come out. There’s a danger, however, in letting negative words continually flow out of you. Rick Warren has a great observation with this. Anger is not something that when you fill up with it, you just let it out and get rid of it. Anger is a little more dangerous than that. When it starts coming out of us, it’s like a machine that can keep producing more and more and more anger. It’s like turning on the switch to the Negative Emotion Factory. This is the same factory that can produce plenty of other negative emotions: sadness, envy, resentment, self-pity. There is nothing wrong with talking about troubles that you’ve gone through. Keep in mind that words fuel your feelings, both negative and positive. Years ago I used to have a constant phrase I would use when people would ask me how I was. It was my way of letting people know how hard I was working and how I was juggling all the challenges of work, family and personal life. I said it ALL the time. Until my wife corrected me after we went to a friend’s party. She had overheard a number of my interactions with other people that night, and the only thing I kept saying was how I exhausted I was. It wasn’t painting our life in a very positive way. After the party that night, I made a concentrated effort to remove the phrase “I’m exhausted” or “I’m tired” out of my vocabulary. Here’s the strange thing… several weeks later after not saying these phrases, I actually started feeling more rested and energetic. My negative phrase and been physically and emotionally running me into the ground for months. I challenge you not only watch your mouth with the negative thoughts and emotions, but to replace those words with phrases that will build you up. Perhaps the negative emotions that you are feeling are really a disguised call for help. Try flipping those words of frustration into “I’m in a rough spot and I need some guidance, direction and support.” There’s a very good chance someone will hear your call and give you the support you need. What negative phrases do you find yourself automatically saying? How could you flip that into a positive? Share your thoughts on my Facebook page. You want to make everyone happy. You don’t want to let anyone down. You want to stretch yourself and grow, but instead you find yourself worn out and exhausted. There may even be a part of your faith which makes you think that you must say “yes” to every request that comes your way because it is your duty. Even though there may be good intentions with saying “yes”, it is not always the best thing to do. We have to learn to say “no”. There are only a set amount of hours in the day and week. In that week, we have to sleep, eat, enjoy our family, friends and loved ones in addition to work and other responsibilities. When we say “yes” to something, we are impacting these areas of our lives. In his book “Essentialism“, Greg McKeown talks about this concept. When we don’t say “no” we are saying “yes” to something else by default. That’s not good. Because now all of our time energy and effort is being spent on tasks that we weren’t supposed to be doing in the first place. I know this first hand. Back in 2005, I left my work at The Disneyland Resort to pursue acting in commercials full tme. But I didn’t have a plan. We had some money as a buffer, but I just thought opportunities would present themselves. Well, several things presented themselves. However, it wasn’t what I expected. I found myself getting over involved in my sons’ school, since I was now a “stay at home dad.” My continual automatic volunteering led me to overextend myself. I couldn’t say no. All of my energy and effort was now being put into projects where people would ask for help. My default answer of “yes” resulted in a never ending cycle of getting frustrated, stretching myself too thin and leaving me with no time to look for work. Our funds soon depleted. I was very fortunate to be allowed back to my work at Disneyland, but I learned a valuable lesson. You can’t say “Yes” to everything. No matter how important it seems. I learned another valuable lesson from McKeown’s “Essentialsim” about making decisions. Ask yourself, “What percentage do I feel like this is the right thing to do?” I’ve had opportunities that have come my way where I felt “Yeah, I feel like that’s about 60% the right thing to do.” That number doesn’t sound so bad…why not, it’s more than 50% right? What it we took that same percenetage of 60% and looked at it as a score on a test? It would be an F or D minus grade at best. And that’s a life decision! Why would we accept failing grades in our life decisions? If you are not feeling 90% or more regarding a decision, if it’s not an automatic “YES!!!! I WANT TO DO THAT, BE A PART OF THAT!” then don’t agree to it. It’s not easy to say “no”, but remember you are making room for that “yes” that can lead to the things you really want to be doing in your life. Where are areas of your life that you are having a difficult time saying “no”? Let me know on my Facebook page. Went to the dental hygienist and was in and out in 40 minutes. It was an easy visit. That was not the case as recently as five years ago. I used to be petrified. I’d have to get myself mentally and spiritually prepared for a visit to the dentist. I had terrible experiences as a child at the dentist’s office. I won’t go into the terrible details, but it really did a number on me mentally. It took me decades to get over this. I had a couple a decent experiences in my 20’s and 30’s with other dental offices, but after another long absence of check-ups and exams, I needed to do something. In my late 30’s I went back again and worked with my current dentist to get through my phobias. I had a couple of advantages going back. Dental technology and practices have greatly advanced. Pain is not the norm in 21st century dentistry in North America. I also had a doctor and dental hygienist that were able to talk to me and explain uncomfortable processes, like deep cleaning and a root canal. You’re probably facing a challenge in your life that’s like the dentist. It could be taxes, debt, finishing school. Maybe you’ve been running away from them for a long time. Running away doesn’t work. It delays that which has to get done. Running away also feeds the “fear monster” that has the habit of turning reasonable concerns into imagined gigantic unconquerable fortresses. These imagined fears of what will happen get so large that we continue running away from what needs to be done. It’s not helping you. It’s hurting you. It’s hurting your forward motion. Have you been running away from something that’s just been weighing on you for a long time? Is it a commitment that honestly you just can’t keep and you’ve got to let someone down? Is it something that you hope will go away, but it has to get done no matter what? Other people have gone through the same situation. Seek them out, give them a call for help. Listen to their story online. You’ll soon discover there are other people who came out the other side of a situation very similar to yours. And they survived. And it wasn’t as bad as they thought it would be. I’m sorry you’re going through this. But believe me, with a little time, a little focus and a lot of support you could have the same feeling of ease I did coming out of the dentist’s office the other day. Share what you’re fighting through on my Facebook Page. It might be a great first place to ask and receive the help you’re looking for to move forward. It’s a question asked constantly when we look at what’s requested of us, our responsibilities, or goals we are trying to accomplish. It can be really depressing and overwhelming. The way it gets done is a little bit at a time. You start. Action is the most important thing you can do, no matter how small it is. The alternative is to do nothing. And that inaction is also a choice. That choice will keep us repeating the same bad habits that have you stuck in your current job,with your health or in debt. It takes a little something to get us moving. We need encouragement. We need little victories in our lives. Sometimes it’s as simple as making the bed, or washing those dishes that have been sitting there for the last few days. Or finally paying the bill you’ve been putting off. A little action leads to a little more, which leads to a little more. Before you know it, you can look back and see all the little things add up. Try something today. Put on some music that will put you in a good mood (or at least in a focused mood) and set a timer for at least five minutes. Write down some accomplishments you’ve achieved over the last year, two years, or how ever far back you want to go. Look at the things that you’ve done and celebrate them by sharing your victories on my Facebook page. If you’ve been able to accomplish things in the past, you can accomplish them in the future. I’ve got some great tools and techniques I want to share with you next month that will help you keep making that forward motion. But for now celebrate the little victories and the big victories and realize you’ll be able to do it again. Onward, upward! It’s something I’ve seen again and again in the entertainment industry, different areas of business and life. The idea that you must be young to accomplish meaningful things in life. If you don’t do it when you’re young, well, it looks like you’ve missed out. You’re too old. The party’s over. The train has left the station. All that’s left now is to accept how thing’s turned out and trudge on with the rest of your life. Let me give you two examples of people who lived their lives fully with purpose until the end. Katharine Drexel and Noah Purifoy. Katharine Drexel (1858-1955) was heir to the fortune of her investment banker father Francis Anthony Drexel. She was a woman who was drawn to help Native Americans and African Americans in the United States. Her life took two major unexpected turns. The first occurred when both of her parents died leaving her and her two sisters an estate worth $14 million dollars ($400 million in current dollars). The second unexpected turn came when at age 31 she made the decision to not marry and instead enter into religious life as a nun. Katharine Drexel began a Catholic religious order that used her share of her inheritance to build schools for African American and Native American children throughout the United States. This was a woman who lived her life as a prayer and spent her life and every last portion of her money to help others who were not seen as equals in society. In 1935 at age 76 while traveling across the country, she suffered a heart attack. Her doctor instructed her that she would have to cut back on her work and change her lifestyle. For the next twenty years she spent every day of her life praying and writing to those other sisters of her religious order. It was what she described as the most spiritually productive period of her life. At age 96 on March 3, 1955, Katharine Drexel passed away after using her entire life as a work and prayer for others. Noah Purifoy (1917-2004) was an African-American artist, sculptor and assemblage artist who lived in Los Angeles and Joshua Tree, CA. Born in Snow Hill, Alabama, he was a veteran in the Armed Forces and eventually made his way out to California where he developed his art. He received his BFA in art when he was 40 years old at what is now Cal Arts. His work “66 Signs of Neon” caught public attention in 1966 when he used salvaged remains to interpret the Watts Riots that had occurred several months earlier in August 1965. He was one of the co-founders of the Watts Tower Arts Center. He served on the California Arts Council from the late 1970’s until late 1980’s. He then moved to Joshua Tree and at age 71 began a prolific work in the desert. 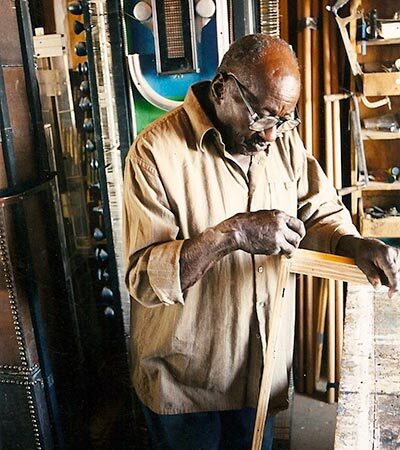 Over 15 years until his death at 86 in 2004, Noah Purifoy created nearly a hundred pieces of art on 10 acres of land in Joshua Tree. These included large scale assemblages, environmental sculptures, and installation art. No small feat. The land is now know as The Noah Purifoy Outdoor Museum. Kate and I saw it on our recent trip to Joshua Tree and it is quite impressive. To think that a man in his 70’s and 80’s could produce that much work that is driven by his purpose and passion… it is an example for all of us for how we should live. Both Katharine Drexel and Noah Purifoy remind us that we are not bound by our age. Our work on this earth is not done until we have drawn our last breath. Until that moment, every thought, every conversation, every work that we do is something that can help or inspire others on their journey. For more information on these inspirational people I would encourage you to watch Bishop Robert Barron’s video about Katharine Drexel and visit The Noah Purifoy Foundation website http://www.noahpurifoy.com. Leave a comment on my Facebook Page to let me know what you thought about these two incredible people. He’s just a salt of the earth kind of guy. An incredible talent and a really killer fiddle player. He also loves to fix and tinker with things. He’s put together hand crafted steam engines and made jellies and juices from his homegrown pomegranates. A couple of years ago, his regular gig at The Disneyland Resort was coming to an end, and like any working musician he was looking for his next gig. I hadn’t seen him for a while, but when I saw him a few weeks ago, he shared a story that I found quite inspiring. Throughout his career as a musician, Duane has been a master at fixing broken instruments. It was just something he could do and he would work side jobs for various music shops and schools. Meanwhile a job position opened up for a larger school district. It was such a big opportunity, that the school district selected 50 applicants to show up for a hands on test to see how well they could fix instruments in a time tested environment. Duane tested in the top 5 applicants. And he didn’t get the job. A few weeks later, the larger school district called him back and said they had another position open that was in their main operations center where all the schools in the county sent instruments that needed to be fixed. Now he spends his days fixing broken instruments and gets them sounding amazing and even better than new. And on his breaks, he gets to play bluegrass with the other fellas at the shop. And the other school district wants to work with him. And Disney has been contacting him about more work. I wanted to share this story because, like Duane, we all have those gifts, abilities and talents that we instinctively do. Duane loves to tinker and fix. He was able to use those talents so that he could support himself during a lean time. It’s never too late to use these talents. Duane is a mature gentleman, but he’s now entered a new chapter of his life and couldn’t be happier for this opportunity that’s come his way. Here’s the other thing I love about this story. Duane’s a positive guy. When a trial came into his life, he hunkered down and did what he could. He’s not the type of guy who gets despondent when a hardship comes along. Like fixing broken instruments, he learned how to tinker around and find a fix for his loss of income. I never saw a man who was so grateful for the opportunity that came his way and now his bucket is overflowing with opportunities. Sometimes we get pushed through a trial because there is something pretty cool waiting on the other side. What talents do you have? What’s that thing that you just seem to naturally do and don’t think twice about? Maybe it’s something that you need to be sharing with the world. Let me know on my Facebook page. I decided to put my money where my mouth is. I left my smartphone behind while I went out of town for the weekend. On purpose. We had been planning this trip for some time. My wife’s father had recently passed away and the last two months (as well as the last two years leading up to it) had been pretty draining. We needed a chance to rest, refresh, reconnect and recharge. That wasn’t going to happen if I brought my smartphone along. I’m like everybody else right now. Checking it constantly, hearing the notifications or feeling the vibrations when an email, text or social media alert came through. This needed to be a special time where I could unplug. We had a wonderful time. We stayed at a beautiful home in Joshua Tree, CA. We read, we talked, we connected, we went for walks, drove into town for mass and a meal. Kate even surprised me with art supplies she purchased so we could draw and paint on our trip. Truly a special time. Here are some things that I learned and felt. Hopefully you can use some of this in your own life and try leaving your smartphone at home. I wasn’t sure how I was going to get through it, but I knew I wanted to try it. I set vacation reminders and autoresponders for my phone and email and let people know in advance that I was not available that weekend. I turned off all notification software on my tablet for email and social media apps. I did use the internet, but only briefly. I looked up a biography on a local artist, what time mass was at the local church, and (to satisfy my curiosity) information to find out how satellite internet works in remote areas. On my first day I discovered, there’s a bit of withdrawal from not having your smartphone. You’re still hanging on to the busy world you’ve walked away from and that bled into some of my conversation. A relative didn’t fully observe the “call in case of emergency rule” but it was a serious enough event that they felt it warranted it. Unfortunately there was nothing we could do to help, and there was not a call for us to return home. I had to make the decision to put the information to the side. Some of the busyness of the world and the phone call bled over into my dreams that first night. It also spilled over into part of the next morning’s writing and prayer. However, by mid morning of that second day..I was all in. Relaxing, napping, drawing, bonding with my wife. You don’t want to fall into the trap of “well I’ll just check this email real quick.” You are setting yourself up for trouble. If a work problem arises that is communicated via email, you’re not going to be available to fix the situation. You won’t be able to get that problem out of your mind during your trip. Or worse, you could start dabbling into work and steal time away from your vacation. It’s not worth it. Years ago, Kate and I learned that intrusions will try to mess up your vacation time. We made the mistake of turning on the television to discover that a celebrity’s son had died at a young age. The news pulled us right out of our good time and just put a damper on the rest of the trip. Try to do a “news fast” if you can. If the news is that big and important, someone around you will let you know. Other than that, it can wait. The other challenge I discovered was having a bit of anxiety as I was traveling home. Had the experiment worked? Would I discover that my phone had blown up with angry voice mails and texts wondering where I was or informing me that I had missed incredible business opportunities? I had missed a few calls, but fortunately, my outgoing message had done the trick. No voice mails and nothing that I couldn’t clean up rather quickly. I am now looking at how I deal with my phone. Unless you are a doctor, no one is going to die if you don’t pick up the phone. It’s important to set boundaries in your life so that you can focus on the more important aspects of life, your family, friends, your health and well being. I’m now experimenting with setting hard boundaries each night and once a week on the weekends. The freedom of not being chained to a phone is pretty exhilarating and I highly recommend you give it a try. What are you thoughts? Have you ever tried this? If so what were the results? Or if you haven’t what are your fears? Join the conversation on my Facebook Page and share you feelings about going phone free for a day or weekend.